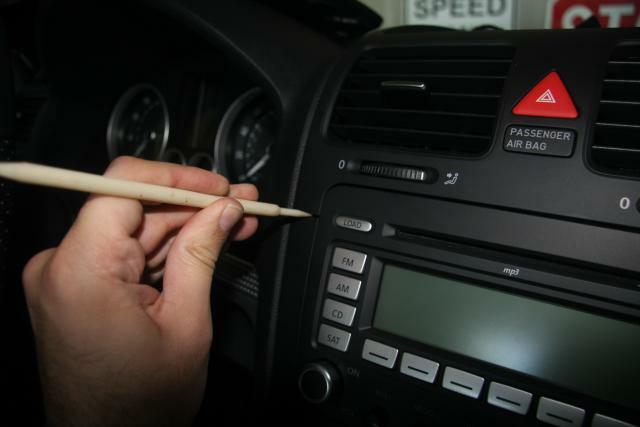 I wanted to share the installation process of the VW Bluetooth accessory in my Mk5 R32. The process should be similar in any recent Mk5 VW. As usual the standard disclaimers apply- this worked for me but may or may not work for you, so use caution. After installing this I want to first say that IMO the Parrot Bluetooth offering is much more feature-rich than this thing is. Pricewise they seem about the same, so do compare the Parrot offering before you commit to this. Also the installation process is fairly complex. Read through this before beginning. The kit comes with pretty detailed instructions on installation, so I won't go into too much depth, except for the parts where it refers you to the service manual which I don't have or is ambiguous. The install took about 3 hours, most of which was spent trying to figure out how to take the car apart without breaking anything. 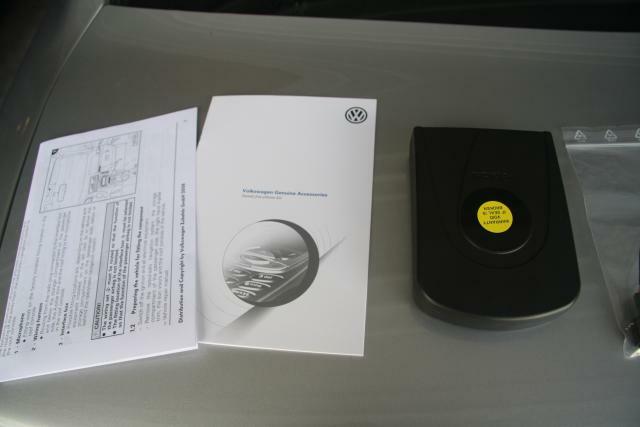 ...installation instructions, supplement to the car manual, and the Bluetooth box itself. 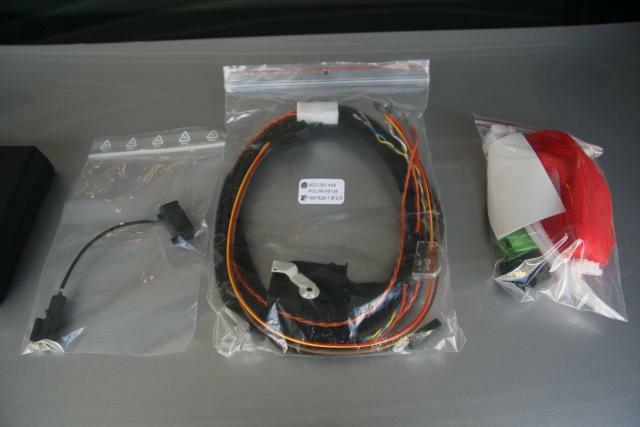 Microphone, wiring harness, and a bag with connectors, zip ties, a chunk of foam tape and a nylon mesh bag. Here's what you're about to take apart! The daylight sensor is circled. Carefully unplug it and set the air diffuser aside. 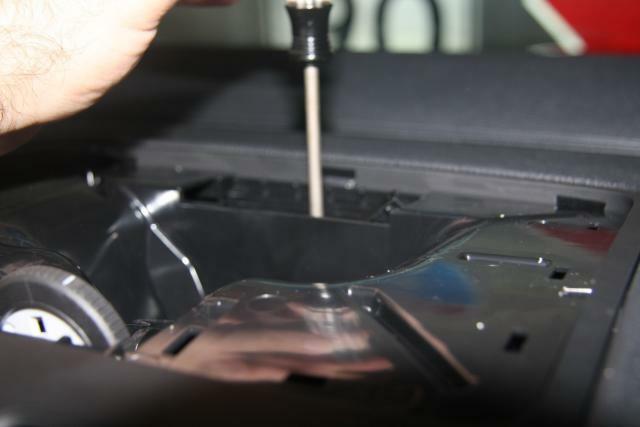 There will be one Torx screw to remove on the base of the diffuser. Be careful not to drop the thing into the vent. Pull up on the rear of it and work the base of the diffuser out. 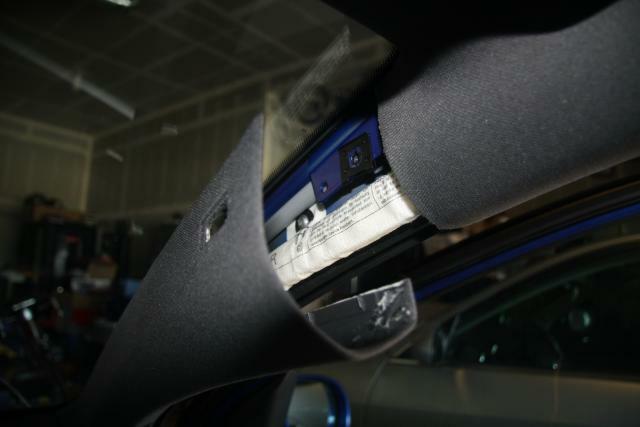 Note the locking tabs in the front, which is why you need to lift it from the back. 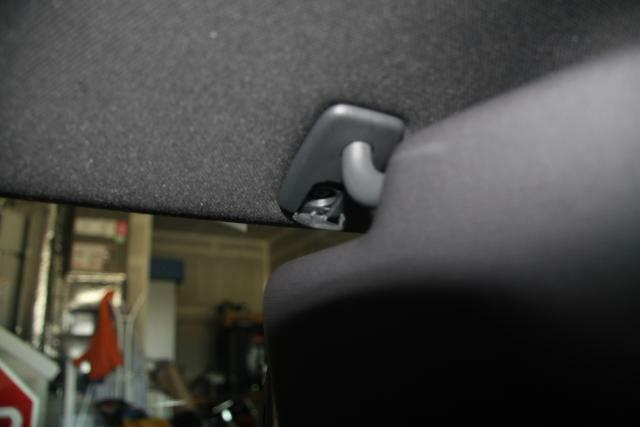 After removing the screws, I used the tool to release the locking tabs and lift the trim piece up slightly. 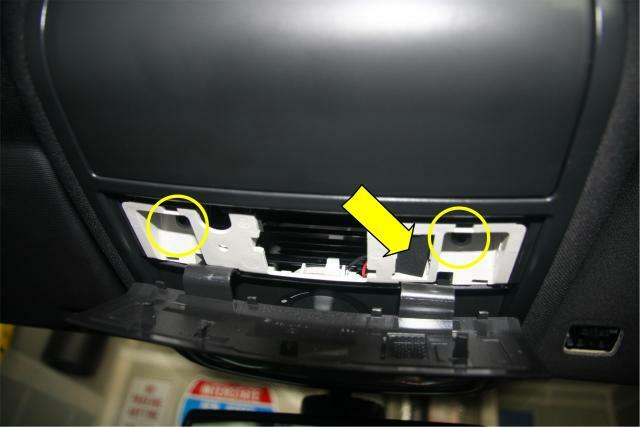 Note the locking tab on the right side of the dash assembly, it may help in understanding how the pieces lock together. 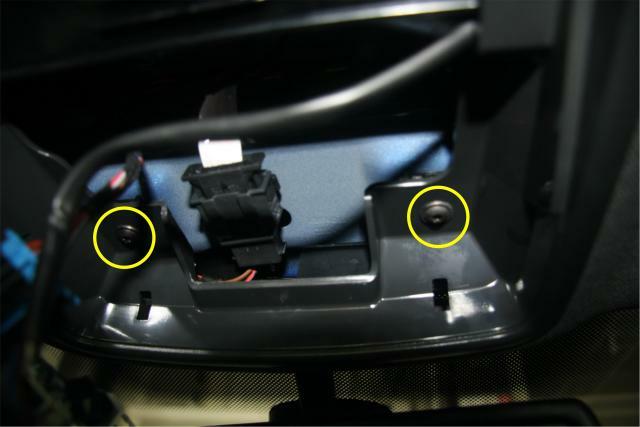 The lower trim assembly is held in by two Torx screws (circled) and is fed between two tabs (arrowed) - remove the screws and lift the trim out of the locking tabs. I then used the plastic tool and worked my way down the trim, popping the clips out one by one and eventually removing the whole piece. 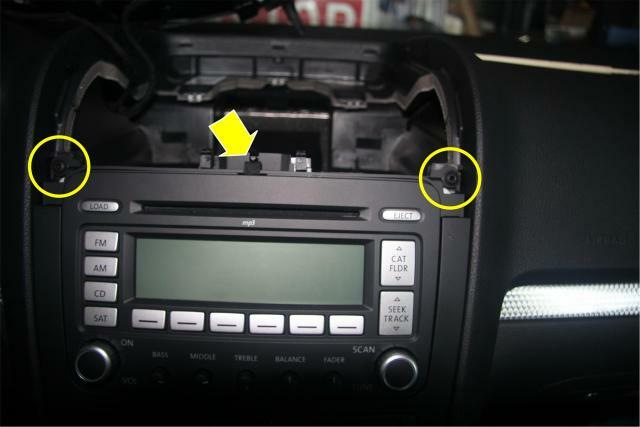 With that lower trim removed, the four Torx screws that hold the radio in are exposed. 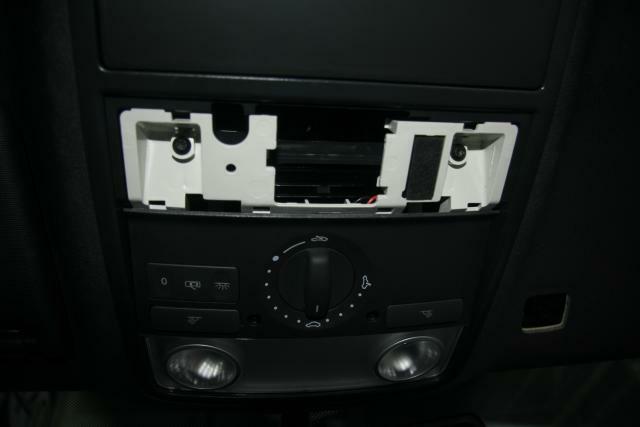 Remove the screws and then you can carefully slide the radio out. The antenna connectors are color coded, so don't worry about labeling them. 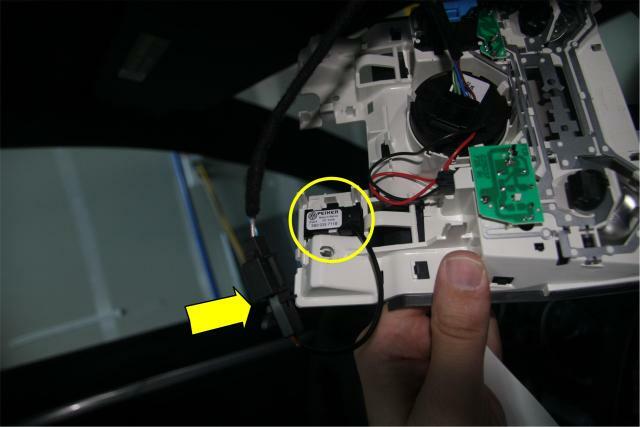 Disconnect the two antenna inputs by releasing their small white locking tabs and pulling them off. 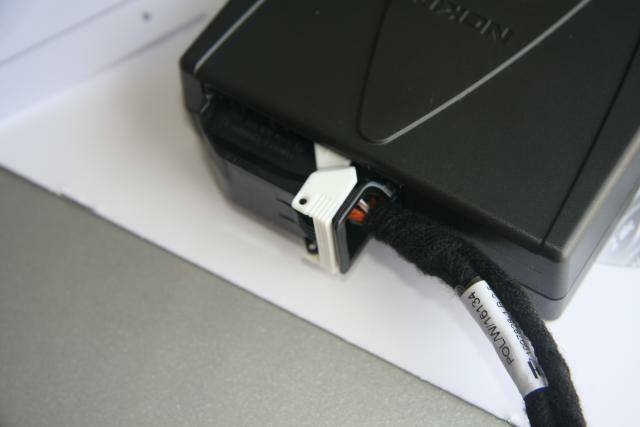 The main connector for the radio has a locking lever on the bottom. Release the lever and the connector will come off. The dash removal part is done. 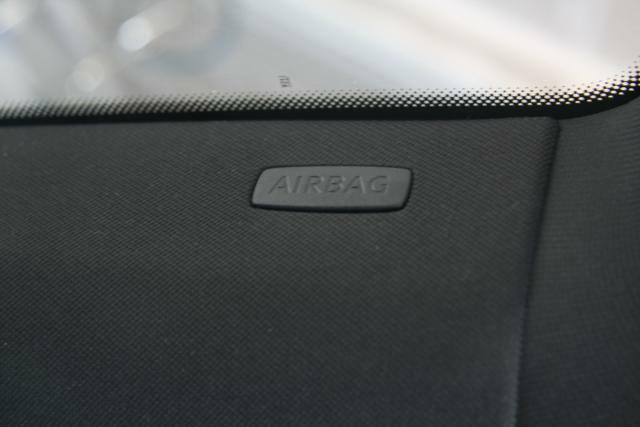 Now you'll need to remove the AIRBAG cover on the passenger side A-pillar trim. 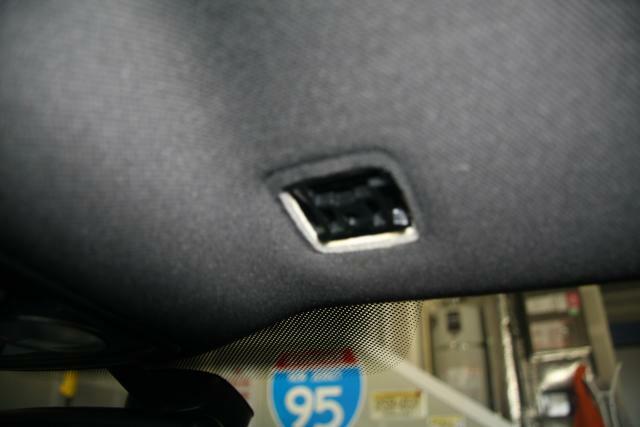 The white thing inside there is the airbag. 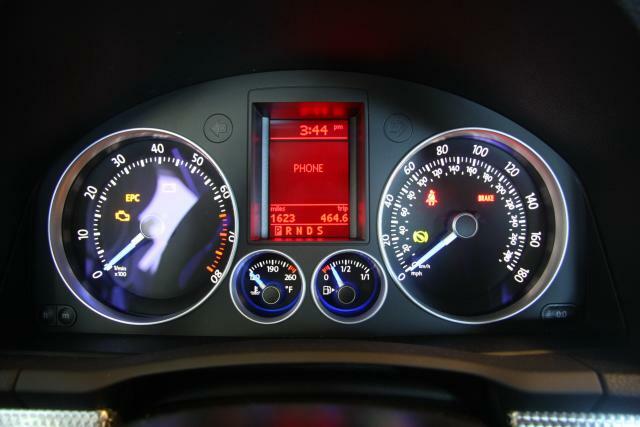 Also at this point, remove the panel from the side of the dashboard and then the small panel that goes between the dashboard and the weatherstripping where the A-pillar's base is. 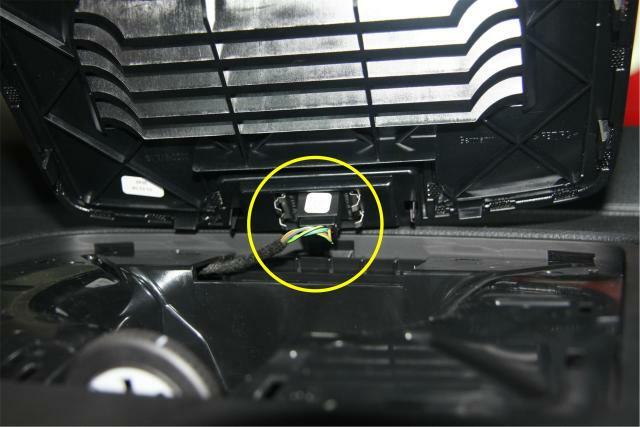 There are two screws to remove (circled) and note the black chunk of foam that's arrowed. This is where the microphone will go. Extract the console at this point. 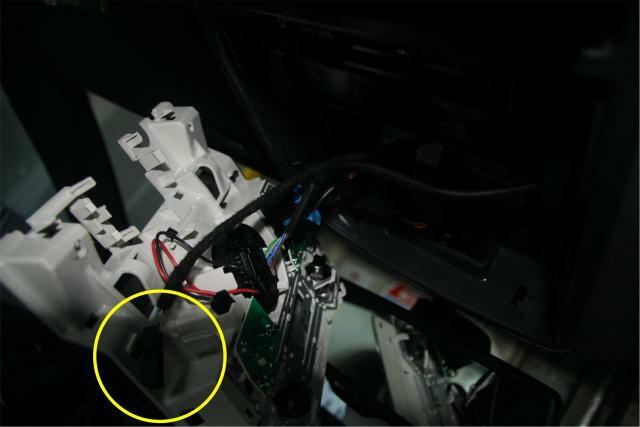 You now need to release the console frame- two screws inside are circled. 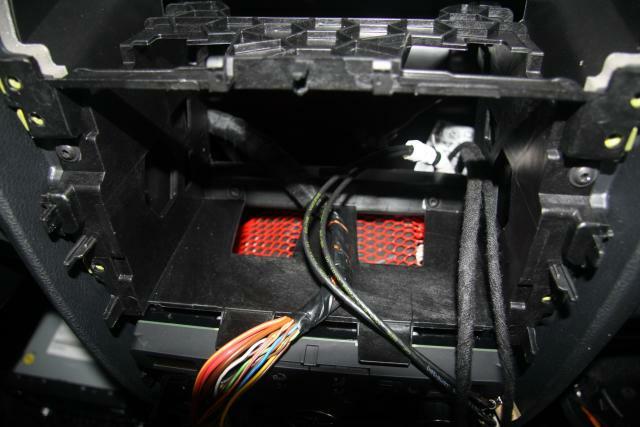 Remove the screws and you should be able to pull down on the frame, giving you enough clearance in the headliner so you can snake the microphone wire up into that space. 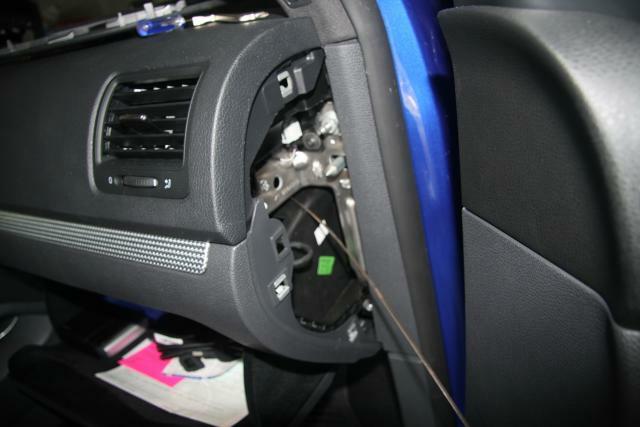 Now, at this point, you are supposed to remove the glovebox. 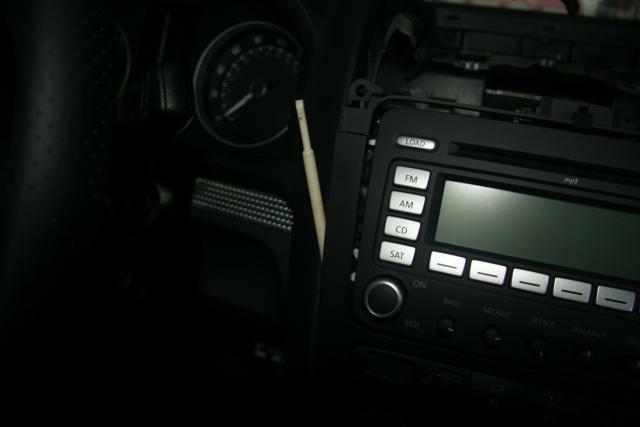 I couldn't figure out how to do that, but I did notice that you could see all the way through the dash, so I used an electrician's fish tape and pushed it though into the middle of the dash. Now we can work on the Volk-L unit itself. 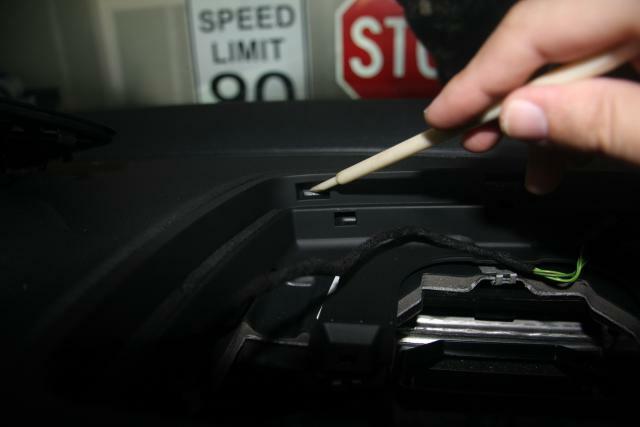 Use the supplies included to zip tie the nylon bag onto the unit. 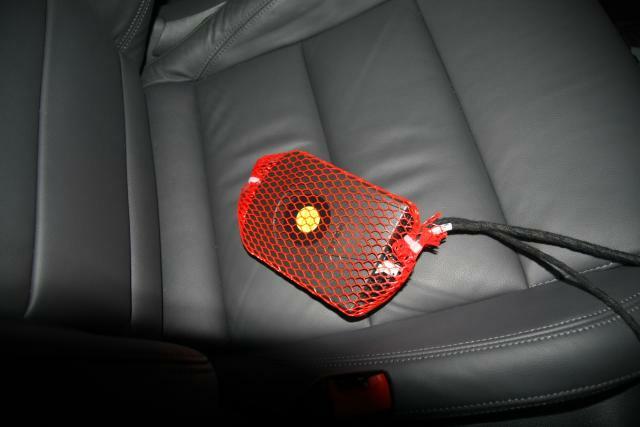 This is used to prevent rattles. 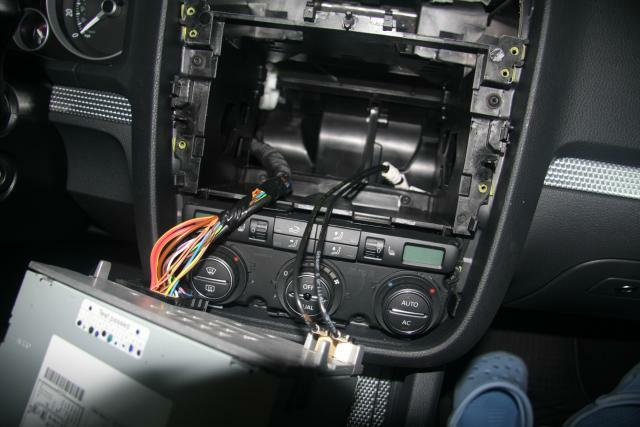 There was plenty of space under the radio cavity to fit the unit itself. 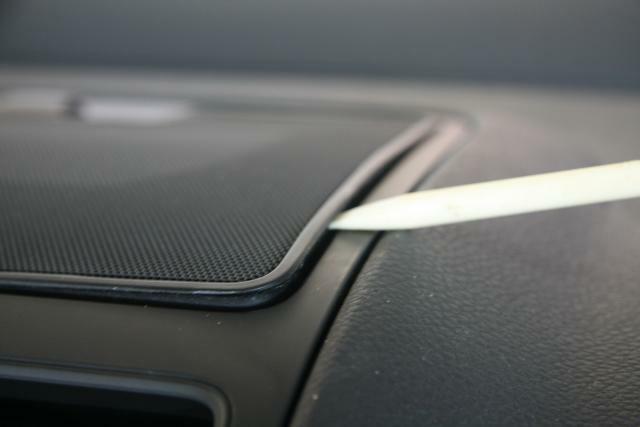 ...and then pull it carefully though the dash behind the airbag and glove box. Install the microphone into the ceiling console. 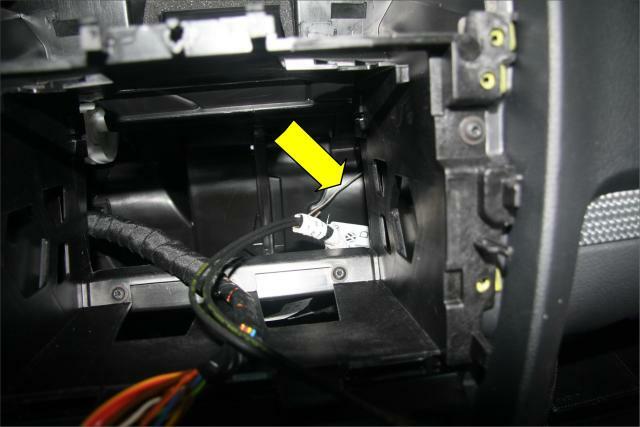 (circled) and attach it to the microphone cable (arrowed) - use the sticky foam tape to wrap the connector so it doesn't rattle around inside. 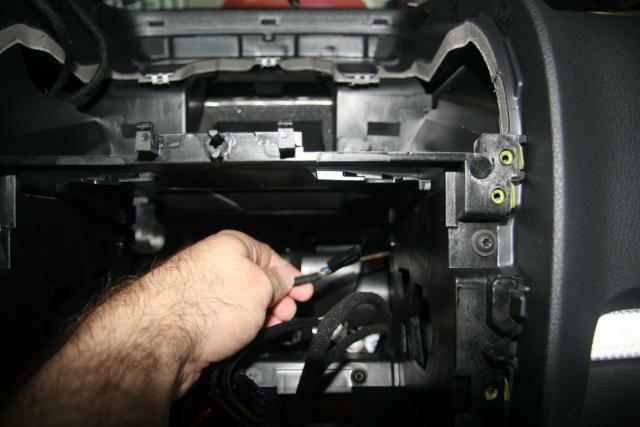 You can now reassemble the console! 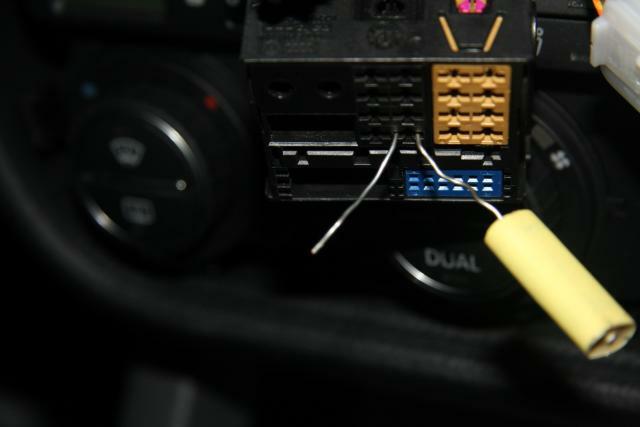 Using a tweezer, squeeze the top locking tabs of the magenta connector lock, lift it out of the radio connector. I used the leads of a capacitor to unlock the pins from the connector, as shown above. 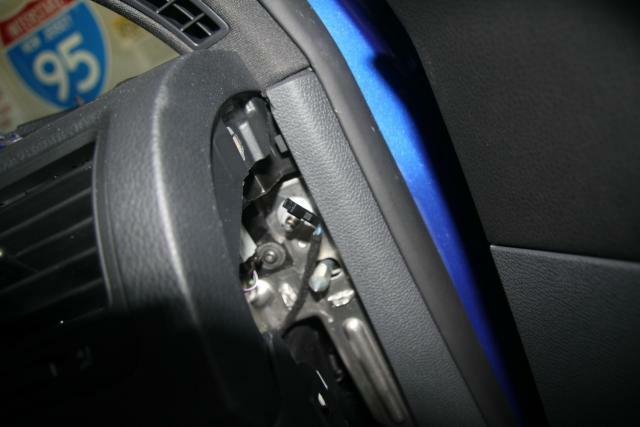 Once the locking tabs are pushed in, you can pull the wire out from behind. 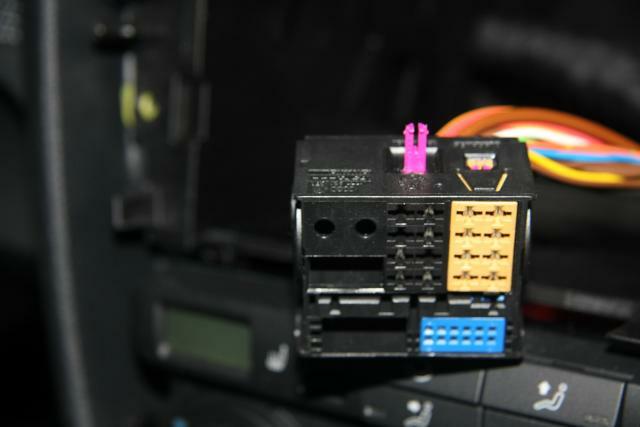 The wires you extract from this connector will be reinserted into the white and black headers that are supplied with the kit. 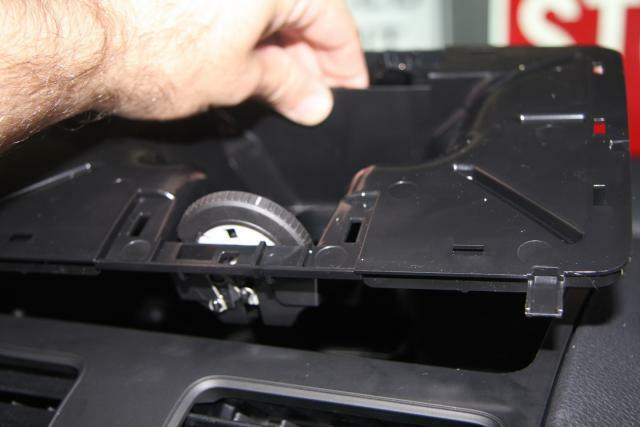 Note that there are pin numbers on the locking tabs if you look carefully- assemble as the instructions detail. 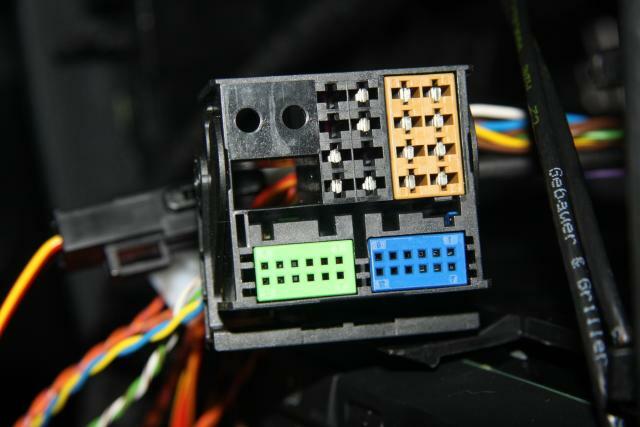 Assemble the rectangular black connector to hold the small pins. and insert the black header into the green housing. 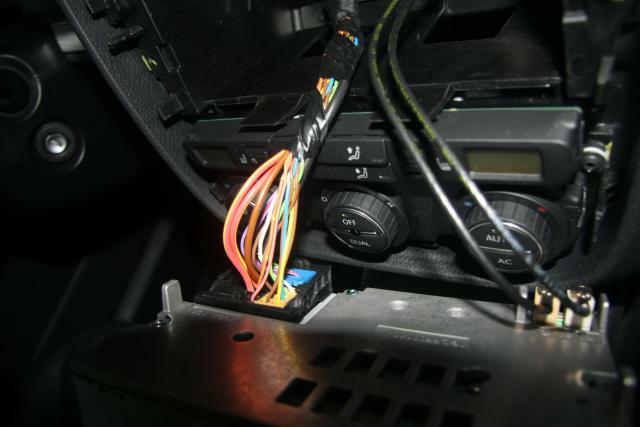 Then the green housing is snapped into the radio connector. 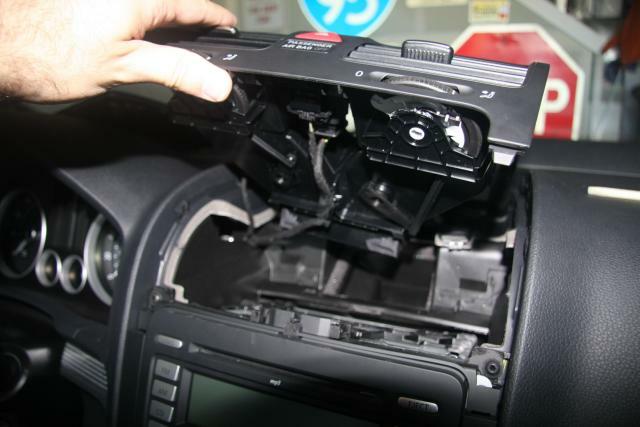 Now you can reassemble the radio. 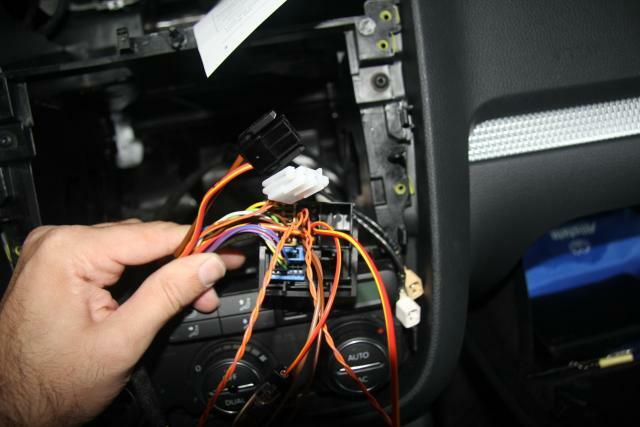 If you disconnected anything (airbag light, switches, sensor) reassemble them so you don't throw any codes when you switch the ignition on later for testing. 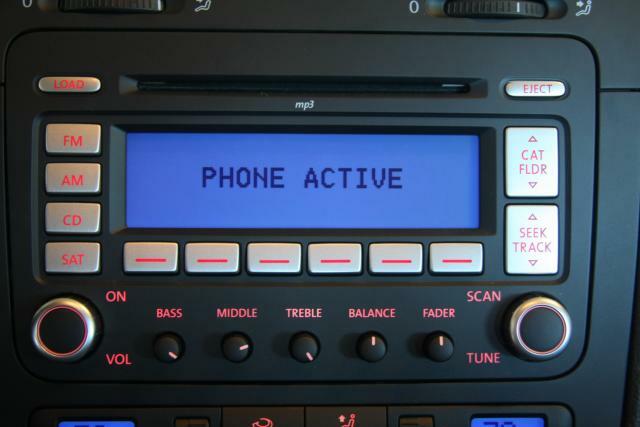 To code the radio with the VAG-COM, I first logged into module 19 (hub) and coded it to enable module 77 (phone). Then I logged into module 77 and set coding to the 3 bytes listed in the instructions. If everything is good, put everything back together, and go hands-free. Awesome DIY - thanks for the contribution! How is the mic's sound quality and is it a 2 wire or 3 wire? The Mic uses a 2 pin cable, and so far everyone says the audio quality is pretty good. I finally managed to get the pins out last night. Ending up using one paperclip on either side of the pin instead of just one paperclip. I used a few different sized clips as well. Haven't made too many calls but so far very happy with the audio quality. I found that people could not hear me on bluetooth headset but they can hear well the volk-l. There is increased road noise for them though. Overall, I am super pleased!! No more shifting and holding the phone with my shoulder. I did my GTI last weekend. Only difference I see is that I used Torx 20 only. 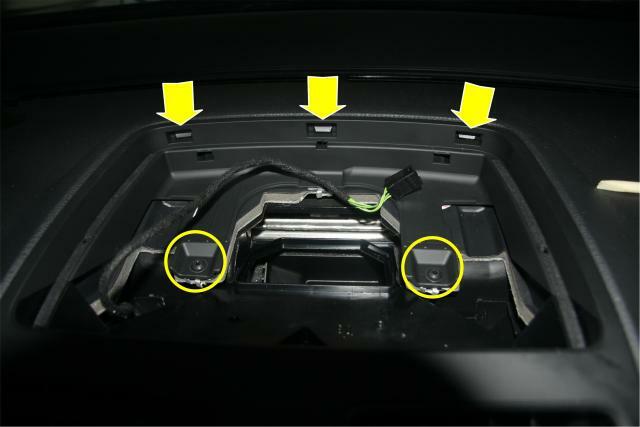 Excellent picts that will be very helpful when installing the Volk-L kit. Mine is working well with my iPhone and RNS-510. I am told I sound clear. I need to remember to have the volume turned up on my iPhone. 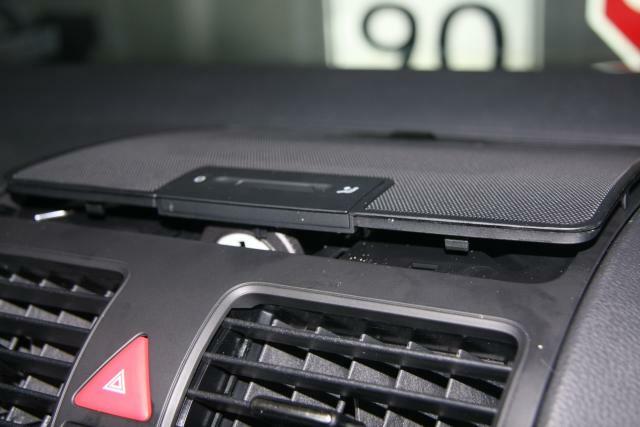 This is a decent solution, essentially eliminates the need to have a headset in the car. Here is another tool to modify the electrical adapter, this one runs 39 bucks. Wow very cool thanks for the write up! I always wanted to have Volk-L.
nOw where everyone else purchased this item from? and how much? I guess you could splice the wires, but I didn't think it was too difficult to remove the terminals from the housings (I used unbent paperclips as my extractor tools). 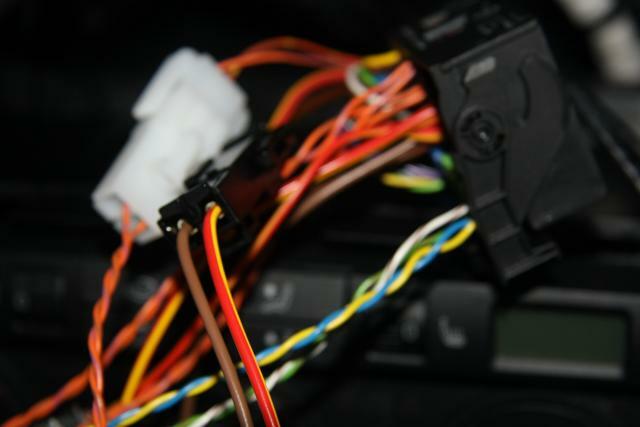 The directions included with the kit have checkboxes to help guide you wire by wire. is there a list of phones that this module is compatible with? Where did you buy this Volk-L and how much was it? Does it have the ability to play music via bluetooth? I know on their site it says it cannot stream music with the iPhone - what phone are you pairing with? 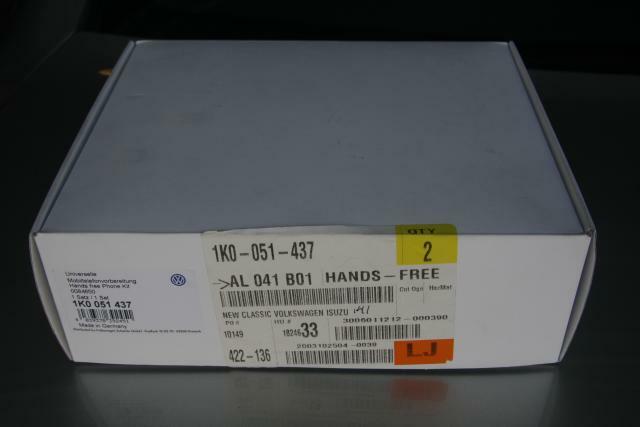 I recently walked into my VW dealer and was told there is now a kit available for my 08 EOS VR6, is this the Volk-L you are talking about? also, you mentioned this parrot bluetooth offering, I went to their page and was unable to locate the kit, the only thing I see are things that plug into the cig-lighter, I am looking for something that is completly invisable, not extra stick on buttons.. is that what the parrot product is? Is $275plus tax is a reasonable price for volk-l from a local dealer? It's $323 from Impex so yeah, I would say it's decent. 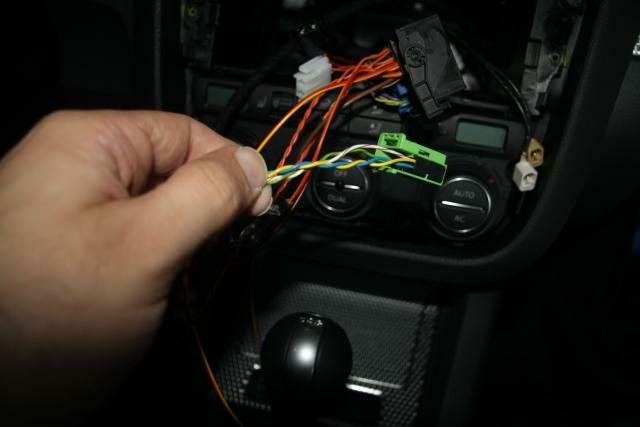 Will this work with aftermarket headunit if I splice the wire to exact pin position? my aftermarket unit uses factory connector to be hooked up. 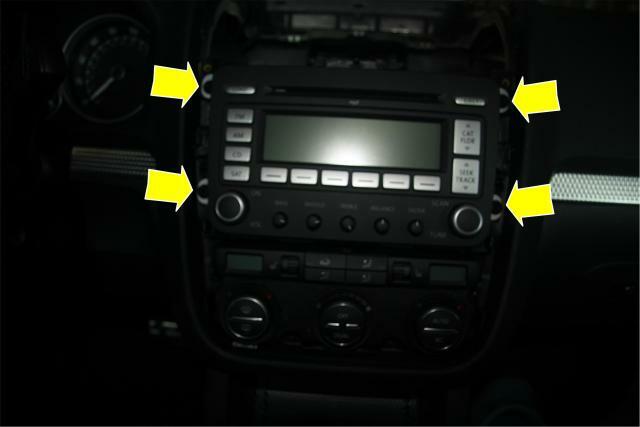 Does the phone has to be set up through the head unit? or can be done through MFD? 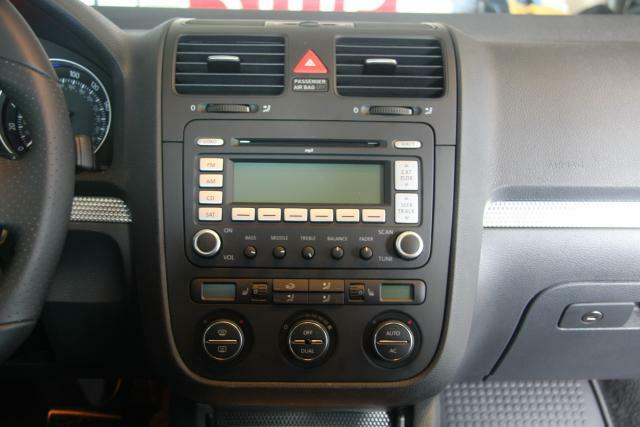 A bit confused as to why VW would sell the Volk-L without the ability to use the MFSW buttons? Is there an upgrade to this kit that allows this? ok so I've installed volk-l and was doing vag-com... and not working.. instead, got bunch of errors.. can anyone help me how to fix these problems? Only thing I've activated was 77 telefone. I had to code my radio to include CAN-Phone control, code the telephone module and the CAN-bus. Then turn off the car, turn back on, clear all codes, turn off, then BACK on.... and all worked fine. can you please detail what you put into mudule 77? I tried many things, none of which worked for me ($40/$21/$20) thanks!